Did this 100-year-old film make people racist? When the first ever feature-length film premiered in LA 100 years ago, viewers were astonished by its cinematography, gripping battle scenes and three-hour running time. But it was also racist and helped revive the Ku Klux Klan. Did Birth of a Nation have a greater impact on real life than any other film? D W Griffith's film tells the story of America during the Civil War and Reconstruction. It depicts black men (white actors in black face) as violent, stupid and obsessed with interracial marriage. In contrast, it paints the Ku Klux Klan as heroes on a mission to protect the country. The film has an "evil, deeply racist side," says Melvyn Stokes, a film professor at University College London and the author of In the Shadow of 'The Birth of a Nation': A Centennial Assessment of Griffith's film. Despite this, the original audiences were "carried away with the drama of it," Stokes says. "It must have been a very emotional experience seeing it then." Critics lavished the film with praise for its cinematic power, says Frank Beaver, a professor of screen arts at the University of Michigan - it completely defied their expectations of what a film could be. It established techniques and tropes that would be used for years to come, which explains why it is listed as 44th on the American Film Institute's list of 100 Greatest Films. But it also had a huge impact on race relations in America. At its first screening, members of the National Association for the Advancement of Colored People (NAACP), a fledgling organisation at the time, protested outside the theatre. Across the country, these demonstrations often flared into violence. They were particularly large in Boston, where local black leader William Monroe Trotter was briefly arrested. In London, the film had a long run at the Drury Lane Theatre and was a critical success, though there were protests here too, mainly from the Anti-Slavery Society. 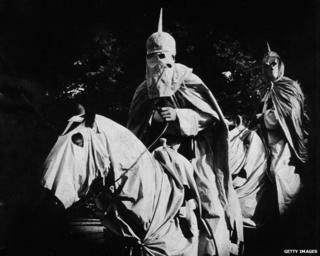 The Ku Klux Klan had largely died out in America in the 1870s, but when Birth of a Nation arrived in Georgia, a local white supremacist, William Simmons, used it as a tool to recruit new members. White-clad riders appeared on the streets. While the Klan's resurgence may not have been a direct effect of the film, it certainly helped promote the KKK's message. "The word had been spread that this was a film that was a powerful attack on outsiders," Beaver says. And the KKK continued to use it as a recruiting film until 1970. On the other hand, the newly-formed NAACP doubled its numbers in 1915, as it tried unsuccessfully to get the film banned. The outcry "helped build the NAACP's membership and some of its causes," Beaver says. Perhaps the film had such an impact because of the way it was structured. The first half "looks just like history in the making" says Beaver. "It led people to believe that this was accurate." It helped Griffith gain their trust before the deeply racist second half of the film. "If you're going to show the film, you know there'll be a bunch of demonstrators outside your theatre," Stokes says. So has it had a greater impact than any other film? Yes, says Beaver. "There is no question. I can't think of another film that has had such a long political arm." There are other films, though, that have had a non-political impact. George Burgess, director of the Florida Program for Shark Research, was a graduate student when the film Jaws came out in 1975 - and while most of the audience gasped in fear, he and a few others spent their time at the back of the auditorium "laughing our heads off" at the mistakes. Like Birth of a Nation, Jaws was a hugely successful film. Burgess hails it as an "excellent piece of cinematography" - as distinct from the later films of the Jaws franchise. It intensified the image many viewers already had of the shark as "the enemy", and even gave it human attributes, such as the desire for revenge. The result was a "recreational onslaught" Burgess says, "a great spike in the number of fishers who decided to go out catch sharks", and this led to a significant decline of the shark population on the East Coast of the US post-1975, he says. An increase in commercial shark fishing occurred at about the same time, resulting in a "double whammy" from which the East Coast sharks have yet to recover, Burgess adds. Though populations are now rising again, they are not predicted to return to their earlier levels for several decades. The effect on the West Coast was not as marked because there is a less diverse shark population, and a greater proportion of Great White sharks - the kind depicted in Jaws - which are hard to catch without specialised equipment. Another example of a film with a quantifiable impact is the Oscar-winning 2004 film, Sideways, about two friends on a trip through US wine country. Paul Giamatti's character refuses to drink Merlot and instead loves Pinot Noir. Soon after it came out, winemakers started noticing what they called "the Sideways Effect". Pinot Noir sales were up and Merlot sales were dropping. Steven S Cuellar, a professor at Sonoma State University, researched whether this effect was actually real. He looked at sales of Merlot and Pinot Noir wines, and a control group of the red wines Syrah and Cabernet Sauvignon from 1999 - 2008. Sure enough, he saw that Pinot Noir sales climbed after the release of Sideways while Merlot sales flattened - the film had indeed impacted wine sales. But sharks and wine are not quite as central to life as the politics of race.